Sharing ideas, creativity, advertising & cool communications in this digital social wonderland. President of KW2 in Madison, Wisconsin, an advertising and digital agency. The SuperBowl ad winners? 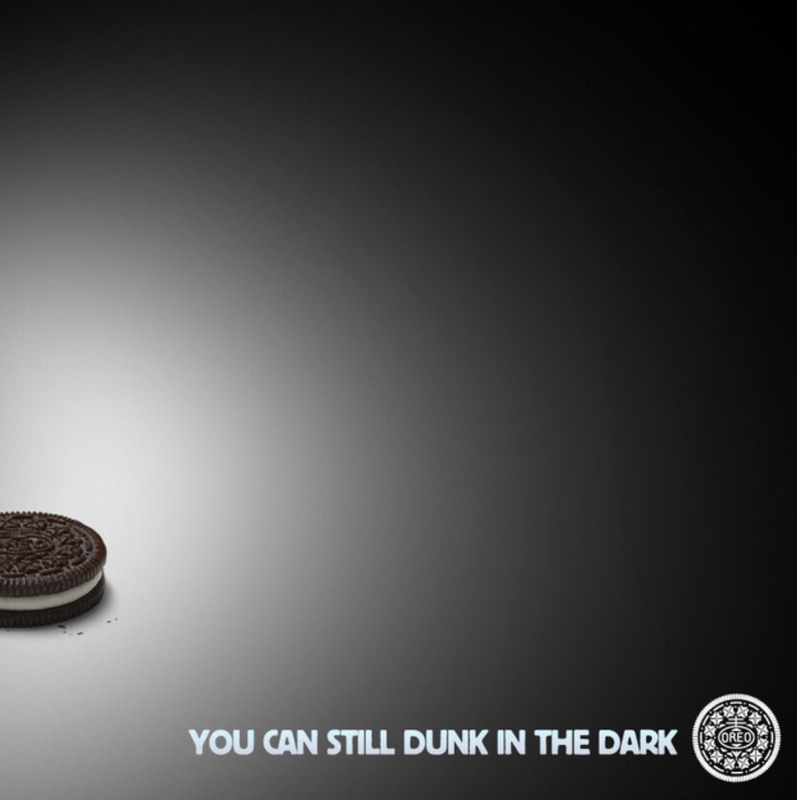 Tide and Oreo, for great ads, AND for owning the blackout with engagement. Fifty five ads, up to $4 million a pop for airtime, watched by 111 million viewers, plus all the internet traffic before and during the game made for a big night. But it was a small bit of engagement that took Tide and Oreo to the top for me. The big lesson for advertisers and businesses out there: we’re NOT in the business of advertising! We’re in the business of engaging with customers. All in all, the best of the best ads were better than in the past, but there were more flat-out duds than I remember in recent years (including Wonderful Pistachio, Blackberry, E-Trade, PepsiNext). This is the year pre-game ads we’re supposed to be the big story. Before the game, VW and Budweiser got great traction and numbers with Get Happy and the Clydesdales, and other brands eked out teasers. So as the game played out, it looked like it would become a battle between the Surprise ads that we saw during the game for the first time (like Ram, and Tide) vs. the Hyped ad that we already saw online. But then there was a plot twist, just when you thought there were no new Super Bowl ad formats. Drumroll please…the blackout! Within 5 minutes Walgreens tweeted “We do carry candles.” Boom. Then Oreo and Tide released social media based ads that lit up the internet. THIS was the big lesson for advertisers – we are in an era when we can use tools like never before to ENGAGE with customers, in real time, not just yell at them with our message. Big lesson. We’re on for our customers 24/7. My favorite TV ads during the game. 1. “Miracle Stain” for Tide. Classic Super Bowl ad: over the top premise, great comedy, a celeb, and a great ending story twist. 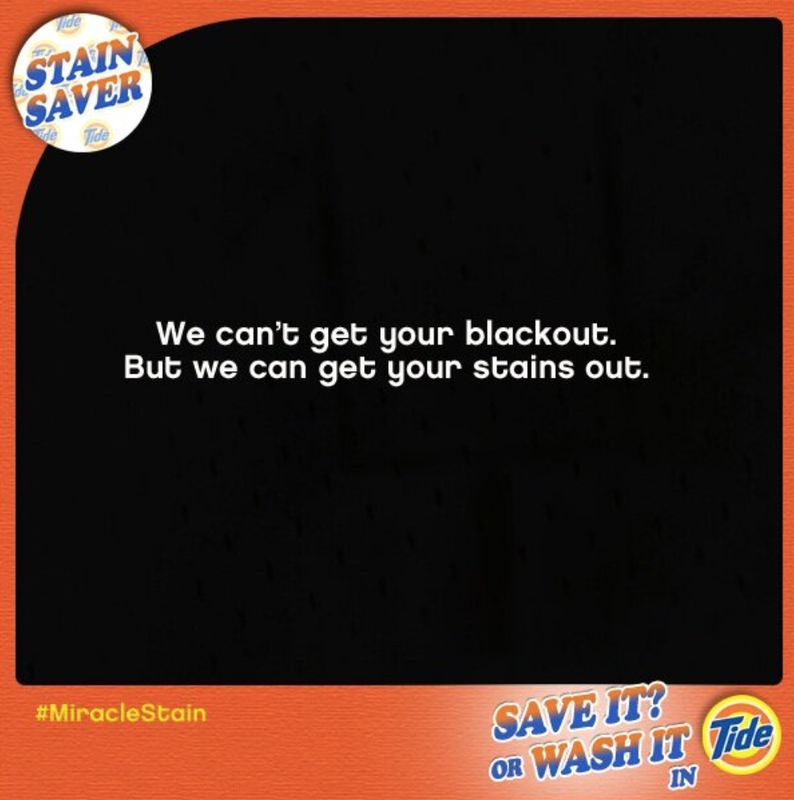 If people start talking about Miracle Stains this week and beyond, the win will be even bigger. 2. Oreo. Hilarious Super Bowl slapstick for this first time Super Bowl advertiser. Great comedy. “Farmer” for Ram. A brilliant ad. But it was stolen from farms.com. But Ram will give “up to” a million bucks to farms.com, so the theft is…uh…okay. So wha-wha, the creators can’t be feeling tooooo awesome about not being able to come up with a great original idea, but America totally loved it. It was a great idea that really stopped viewers. This was my favorite ad because it was just so different by taking the courage to really say something: “We owe farmers, our classic American underdogs, a huge debt.” Man, I wanted this to be the best ad, but if it’s stolen, nope. Dang! “Get Happy” for VW. Sells something, it’s funny, and will get cultural buzz around the water cooler, mon. Clydesdales for Budweiser. USA Today’s winner. I really disliked the ad because it doesn’t sell beer, it’s totally ridiculous and not in a hilarious SuperBowl way, and sure enough, America loved it. We are total suckers for the animal ads and the sentimental “awwwww” story. The ending’s “name the baby horse” schtick was totally horsey to me, but good for fan engagement. Tide and Oreo, for very strong ads that actually sold something, AND for engaging with customers real in real time by creating those ads that integrated their products with the blackout. Brilliant. They engaged. THAT is what great advertising in 2013 is all about. Wow Budweiser! “Landslide” what? Are you selling something what? Then a name-the-baby contest what? Terrifically bad, but it’ll score well, that’s what. A new Super Bowl ad form is born: the Blackout Ad. Oreo, Tide and Walgreens are all taking advantage of the world’s most awkward power outage with some smart advertising. The best Super Bowl ad? Walgreens. They have candles. Walgreens just put this on Twitter. Brilliant. The first ad is here, the first ad is here! It was blah as an ad, but brilliant as a business strategy: introduce a new product with the first ad position in the Super Bowl. Big idea. Although stealing share from great craft beers, like we have here in Wisconsin, will be a lonnnnnnnnnng uphill climb for a company whose flagship brew is bad beer. Good luck with that In-Bev! We’ll see if Black Crown will be around for the next Super Bowl. The M&M’s ad was fun. I bet Meat Loaf is laughing. Seems like the more lame the song is, the more funny the ad can be. Audi and Mercedes must use the same research. They’re both pandering to the high school reverse-asperation phenomena reserved for brands like Axe. Bad form for such prestigious brands. The year Super Bowl advertising got more like Christmas advertising. Remember when Christmas ads and promotions started a couple of weeks before Christmas? Then year by year, the ads would start earlier and earlier. Soon we’ll have Christmas ads starting on July 5th. Last year, Volkswagen got the Super Bowl advertising party started early, and got 10 million views of their great Darth Vader ad before game day. Despite that, Chrysler won in my opinion, with a strategy that included no pre-game teaser, hype, contest or social media engagement. This year, more brands got the party started early as a way to justify spending $3.5 to $4.5 million. This is making two kinds of ads become part of our beloved cultural institution – The Surprise Ad and the The Hyped Ad. What’s better? Nobody knows until well after the Super Bowl. But one thing’s for sure. Super Bowl ads were once relegated to game day. Then the started to stretch out well after game day. We are very much in “before” game day mode. But how long will the new “before” last? Here’s a quick tune to help you get up, get energized, and light the rocket on your creative, idea-filled work week. Awungilobolele by Udokotela Shange Namajaha off The Indestructible Beat of Soweto, a phenomenal compilation of music coming from South Africa in the 1980’s. Five Guys Named Moe by Joe Jackson off of the fantastic Louis Jordan tribute album. Do yourself a fave and dig into some Louie Jordan. A fun, creative tribute: 50 new logos for 50th anniversary of the Rolling Stones. 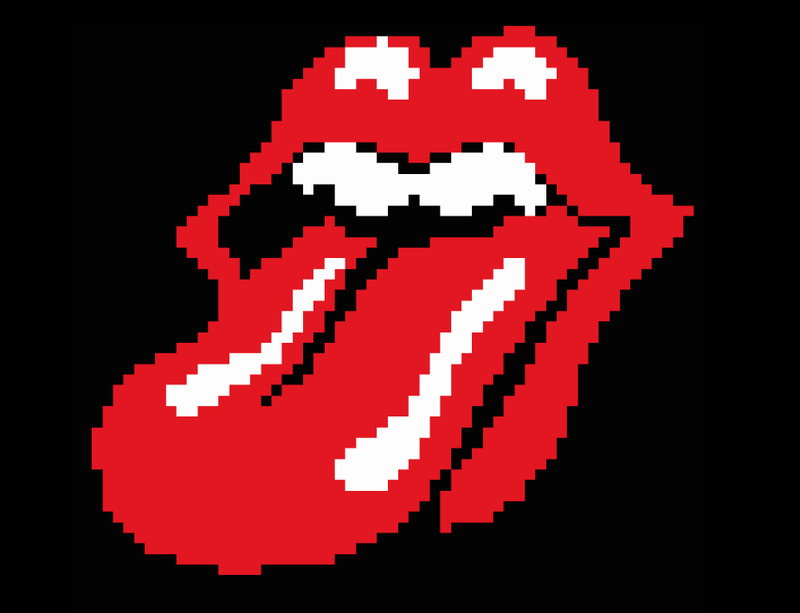 A bit-mapped riff on the Stones’ iconic logo. For designers, this is a fantastic assignment in creativity: mess with one of the world’s most iconic logos, that of der Rolling Stones. Bitan Franco and Álvaro Sotomayor of Publicis Madrid and Wieden Amsterdam worked with designers from across the world to create this neat tribute. They call it the 50 New Logos Project. Here’s another site with the logos, presented more scrolly. Some are better than others. Some are respectful. And I bet the Glimmer Twins dig the disrespectful takes as well because hey, part of the Stones modus operandi is to make rock and roll rebellious. For the designers, a great challenge. For Stones fans, they’re all a pretty good time. And, just because, here’s my fave Stones song: Happy. These are bourbon ball ice cube makers. It makes four ice cubes. Four enormously huge, whiskey-loving ice cubes. It’s simple. Give away exclusive cool stuff, for free. Here’s Maker’s Mark website where people can sign up for the Ambassador program. And here are some neat photos from Maker’s Mark fans over at Flickr. Enter your email address to follow this blog and receive notifications of new posts by email. Your email won't be used for anything other than this automagic thing sending you the email you requested. ©2013 Andy Wallman All rights reserved.